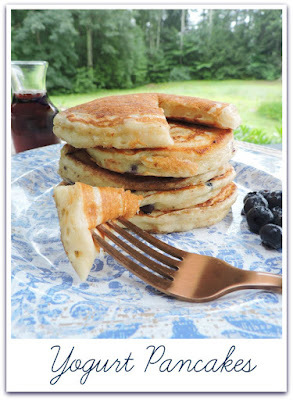 Freeze option: Arrange cooled pancakes in a single layer on baking sheets. Freeze overnight or until frozen. Transfer to a resealable plastic freezer bag. May be frozen for up to 2 months. To use, place pancakes on a microwave-safe plate; microwave on high for 40-50 seconds or until heated through. Those look fluffy and so good! Yogurt is not something I'd think to use in pancakes but it definitely works. Can't wait to give them a try. Me either! Gotta sneak in that extra protein when I can! My kids will love these!! These pancakes look absolutely picture perfect! They're so light and fluffy! I rarely have buttermilk i the house to make pancakes so I often use a combination of yogurt and milk. But now that I see yours I have to try all yogurt.